Refraction is the bending of light when it passes from one medium to another. Vision results when the light rays are refracted in the eye as they pass through the cornea and the lens and are focused on the retina. The retina converts these light-rays into signals that are sent through the optic nerve to the brain which interprets the images. Refractive errors cause near or farsightedness where the person is unable to focus very well on far or near objects respectively. Changes in the shape of the cornea, the length of the eyeball, or the aging of the lens can prevent light from focusing directly on the retina, causing refractive errors. Myopia (nearsightedness or short sight) is a condition where objects that far appear blurry as against objects that are close. With myopia, the light comes to focus in front of the retina instead of on the retina. Hypermetropia (Hyperopia, farsightedness or long sight) is a condition where objects that are close by appear blurry as opposed to distant objects. The light comes to focus behind the retina instead of on it. Astigmatism is a condition where the eye does not focus light evenly onto the retina. This can cause images to appear blurry and stretched out. Presbyopia is an age-related condition in which the ability to focus up close becomes more difficult. With increasing age, the lens loses its flexibility and can no longer change shape enough to allow the eye to focus on close objects clearly. What are the symptoms of refractive errors? Vision testing helps uncover refractive errors. These can be performed manually using vision charts or using computerized eye testing. A detailed eye examination with pupil dilatation is required if surgery is considered. The doctor determines the exact refractive error with special attention to the surface cells of the cornea, the shape and thickness of the cornea, the pupil size, the intra-ocular pressure, the optic nerve, and the retina. Eyeglasses are the simplest way for correcting refractive errors. Contact Lenses provide a more precise refraction correction by becoming the first refractive surface for light rays entering the eye. They provide a clearer, wider field of vision. They are safe and effective if used with care. Refractive surgery is an option for those who wish to reduce the dependence on prescription eyeglasses or contact lenses. Surgical procedures correct common vision problems like myopia, hyperopia, astigmatism and presbyopia. Refractive eye surgery can also attend to spherical aberration and even degenerative disorders like keratoconus. The most common form of refractive surgery is LASIK, where a laser is used to reshape the cornea. Refractive lens exchange (RLE) also known as clear lens extraction is used to correct extreme farsightedness or nearsightedness. It may be appropriate for people with thin corneas, dry eyes, or other minor problems of the cornea. To correct astigmatism, a LASIK or related procedure can be combined with RLE. 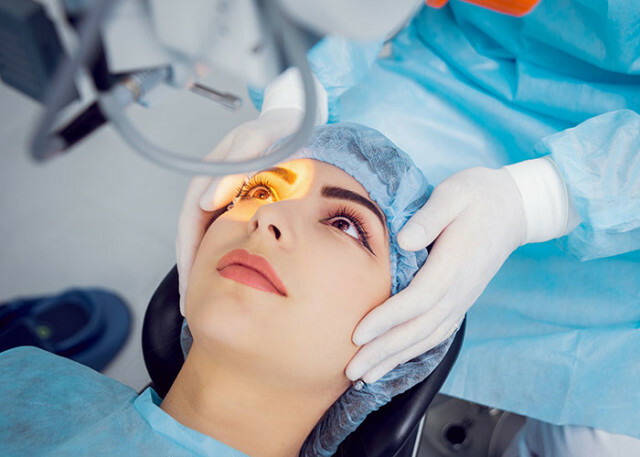 For most refractive errors, laser surgery has replaced the more traditional radial and astigmatic keratotomy due to its ability to treat a broad range of errors. Computerized topography and computerized aberrometry can be used pre-operatively to determine the best procedure and post operatively to determine whether additional correction might be needed. Refractive surgical procedures are generally brief and cause little discomfort. Eye drops are used to numb the eye. Usually, a person can go home soon after the procedure. Most people do not need corrective lenses after surgery. However, people older than 40 may need to wear eyeglasses for reading after the surgery. Certain rare complications of refractive surgery can include over correction, under correction, excessive inflammation, infection, double vision, or astigmatism.